Jake Swanson 16MPH on his family farm in Iowa. His REAL experience has broadened his thinking about issues in food defense, such as the recent outbreak of avian influenza. 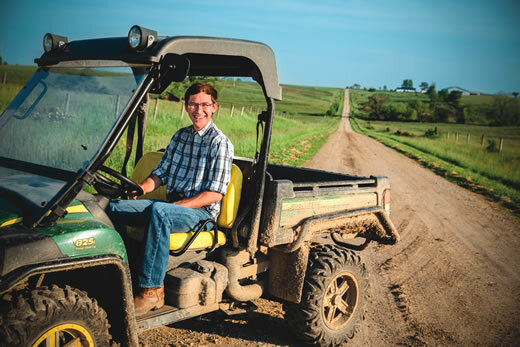 When Jake Swanson 16MPH left his family’s 2,500-acre farm in southeast Iowa to attend Rollins School of Public Health, he was intent on marrying his interests in agriculture, food security, and emergency management. He soon began working in the Emergency Management Division at the Georgia Department of Agriculture (GDA), one of more than 450 paid work experiences available to students through the Rollins Earn and Learn (REAL) program. At GDA, Swanson updated the Georgia Food Emergency Response Plan and standard operating procedures for the Georgia Food and Feed Rapid Response Team. He also coordinated a new initiative to aid in food safety and defense during food transport and helped plan a regional food emergency exercise involving response teams and public schools in Georgia, Mississippi, and North Carolina. "We have benefitted tremendously from Jake’s contributions. He has taken the lead on several critical projects in the office," says Venessa Sims, his GDA supervisor and mentor. "I’m the only employee in the Emergency Management Division, and having high-level MPH candidates like Jake contribute to my office has been a blessing and a successful partnership."